William Tomkins was one of the five children of Rev Thomas Tomkins (c1761-1839) and Mary née Messiter. He was born in Yeovil in 1799. William had three older brothers; John, Thomas and Edwin (1791-1861) and a younger sister Letitia (1808-1876). William qualified as a Doctor of Medicine and was a Licentiate of the Royal College of Physicians and MRCS. In 1822 he married Hannah Holland (1799-1871) of St Saviour, Southwark, Surrey. 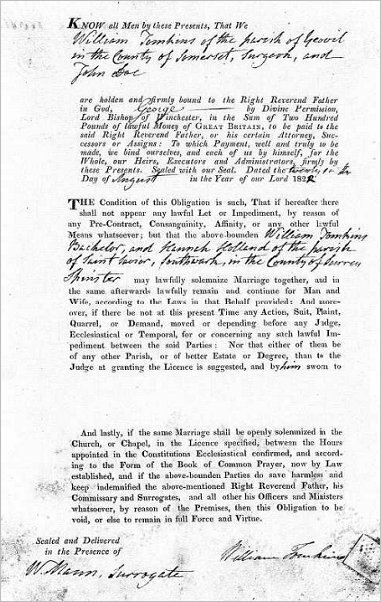 The 'obligation' to marry made between William and Hannah, dated 29 August 1822, is shown below. Two hundred pounds (equivalent to more than £170,000 at today's value) was to be paid to the Bishop of Winchester as part of this legal transaction between the parties. William and Hannah were to have seven children, all born in Yeovil; William Fancourt (1825-1899), Mariane (b1828), L Jane (b1830), Emily (1831-1902), Henry Holland (1831-1907), Fanny (b1833) and Lucy (b1838). 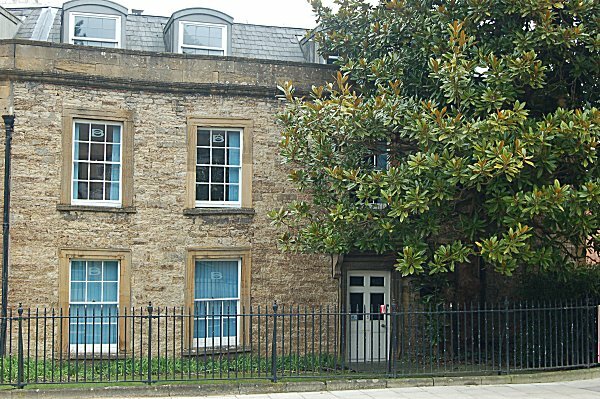 William's medical practice, and also his home, from the 1820s until his death was Magnolia House in Hendford (today's Princes Street). During the Yeovil Reform Riot of 1831 his house was attacked by the mob and the Royal Cornwall Gazette, in its edition of 5 November 1831 reported "Mr William Tomkins, surgeon, of this town, with the assistance of a workman, made an effort, in the early part of the attack, to clear the room first broken into by the rioters, and they had partially succeeded in driving them out, and would have maintained their ground, had not the attempt been made to set fire to the house." His testimony at the trial is reproduced in the Gallery below. William was a member of the Freemason's Yeovil Lodge of Brotherly Love, being initiated in 1831 at the age of 29. He was Worshipful Master of the Lodge in 1837 and again in 1841. In June 1837 William was appointed Registrar of Births and Deaths for Yeovil District comprising the parishes of Yeovil, Preston Plucknett, Lufton, Mudford, Brimpton and Thorne Coffin. He held the post until retiring in May 1855. His successor was Joseph Whitby. He was a member of the committee convened to establish a railway station in Yeovil and at a public meeting held at the Three Choughs Inn he proposed "That in the opinion of this meeting, it is indispensable for the interests and convenience of the Inhabitants of Yeovil that the main Line of any Railway proposed as the direct Route from London to Exeter and Falmouth, should pass and leave its Station as near as possible to the Town and that any Company neglecting to accommodate us in this respect does not merit our countenance and support." William was also a Police Commissioner and in 1838 gave evidence in the manslaughter trial against James Beare, watch-man of Yeovil. He published many medical papers and letters - an interesting example is shown in the Gallery below. Rising in eminence throughout his career, he was Chairman of the Crewkerne & Yeovil Medical Association in the early 1850s and served as the Coroner for Yeovil. In the 1841 census he was listed there as a Surgeon, together with Hannah and their seven children. In the 1851 census William and Hannah were still at Magnolia House with four of their children, a medical pupil and three servants. William gave his occupation as "M.D. 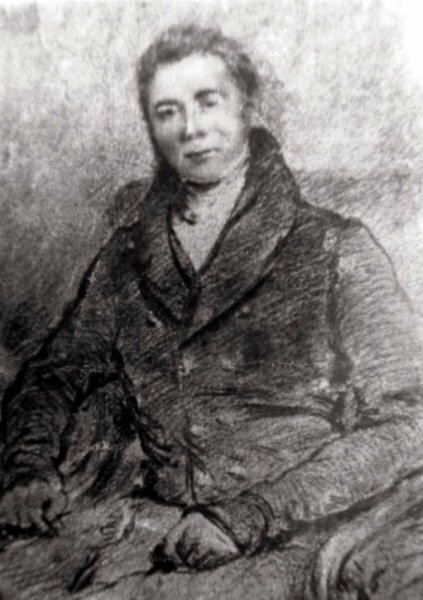 London College Consulting Physician" and his eldest son, 26-year old William Fancourt, gave his occupation as a practising Surgeon. William Tomkins Snr died at Magnolia House on 8 November 1855, aged 56. 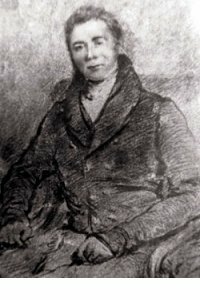 A sketch portrait of William Tomkins, probably dating to the late 1820s or early 1830s. The 'obligation' to marry made between William Tomkins and Hannah Holland dated 29 August 1822. Two hundred pounds (equivalent to more than £170,000 at today's value) was to be paid to the Bishop of Winchester as part of this legal transaction between the parties. 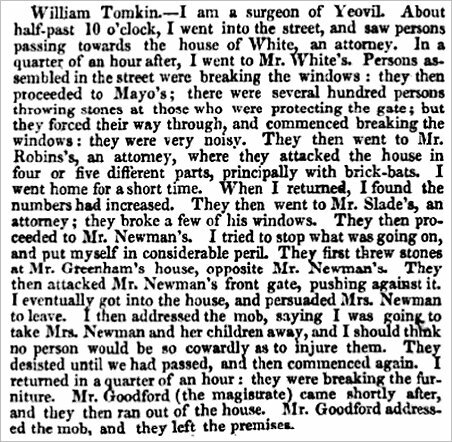 William Tomkin's evidence given at the trial of the Yeovil Rioters, as reported in the 6 April 1832 edition of the Evening Mail. 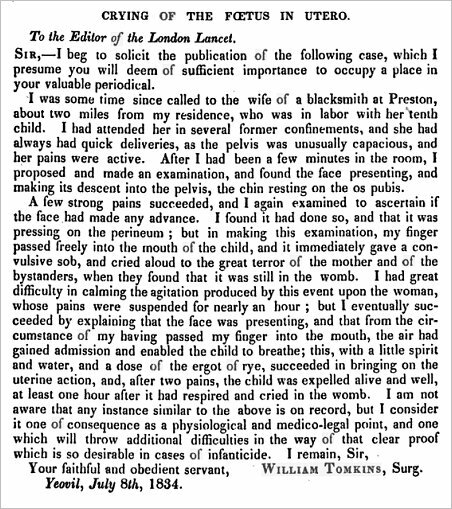 An interesting letter, dated 8 July 1834, from William Tomkins to the editor of the London Lancet. Mansion House and MagMagnolia House, photographed in 1990. 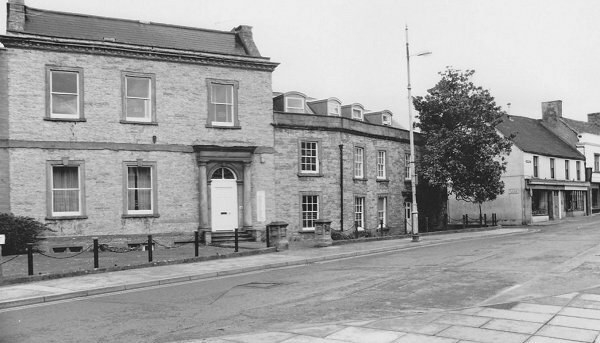 Magnolia House (at centre and on the corner of North Lane) was the home and medical practice of William Tomkins Snr from the 1820s until his death in 1855. Magnolia House, Kingston (now Princes Street), somewhat dwarfed by the Magnolia tree from which the house derives its modern name. Photographed in 2013.